Home > 2016 > 12/28 > Is Troy Stecher Already the Canucks’ Best Defenceman? 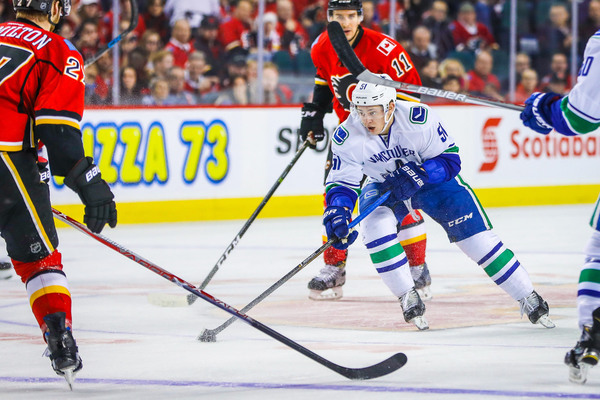 Is Troy Stecher Already the Canucks’ Best Defenceman? Troy Stecher could have spent this entire season in the AHL, and I’m sure the Canucks wouldn’t have batted an eye. So his emergence as a staple on the first pair must feel like something akin to stumbling upon a winning lottery ticket at Pat Quinn Way. With Stecher, as with any first-year pro, injuries above him helped pave the way for his ascendancy. That much is certain. This didn’t happen by accident, though. Stecher did everything in training camp to put himself atop the Canucks recall list, and he’s done everything since to keep him from it in perpetuity. Part of that is opportunity, and Canucks Head Coach Willie Desjardins deserves a fair amount of credit for not shying from offering Stecher more than his fair share. It’s not often a player jumps straight from the AHL to the parent team’s first pair, but the comfort Stecher displayed with Alexander Edler in the pre-season made clear that was the best position for him to succeed in immediately. It didn’t hurt that it was Chris Tanev (Edler’s usual partner) who Stecher was stepping in for, but as the Canucks get increasingly healthy, it’s becoming clear that this isn’t just an act of convenience. Edler’s returning to the Canucks’ lineup tonight, and with Tanev’s return mid-way through December, they’re both healthy for the first time since November 2nd. The Canucks blue line is as healthy as one could reasonably hope for at this time of the year, and Stecher remains alongside Edler on the top pairing. That pair is here to stay, barring injuries. Intuitively, Stecher playing on the top pairing indicates he is among the Canucks’ best defenceman — the best two, to be exact. That’s especially true when the only regular from the Canucks’ top four that isn’t present is Erik Gudbranson, and he’s spent the entire season on the second pair. Is Stecher the Canucks’ best defenceman, though? That’s another question entirely. Now that Stecher’s played more than a quarter of the season, it’s one we can reasonably ask. While the premise itself may give you reason for pause, Stecher’s case isn’t without merit. If you look at Stecher’s impact on his teammates’ ability to control shot attempts, his CF60 Rel. Tm of 1.7% indicates he’s having the second best impact among Vancouver’s defencemen. Even through the less focused lens of score-adjusted Corsi For, Stecher’s 48.2% is second only to Nikita Tryamkin’s 49.4%. Controlling the flow of play is often an area where young players, and rookies in particular struggle most. Small picture, the Canucks have to be encouraged by Stecher’s showing; big picture, it has to be relieving that second-year defender Tryamkin is right alongside him. Finding players to help tilt the ice at even strength hasn’t generally been a problem for the Canucks, though. With Edler and Tanev, among others, the Canucks have always fielded a relatively strong blue line in terms of their ability to transition play and keep the opposition far from their end. Where Stecher is unique among Vancouver’s blue line is his ability to contribute offensively, too. The Canucks have had two 30-plus point seasons from defenceman since the 2013-14 season. If you prorate Stecher’s nine points in 26 games over an 82 game season, he’s barely short of that with 28 points. If you take into account Stecher’s 17th best shot rate among defencemen (6.07 per hour at even strength) and the fact he’s converted on exactly zero of those shots, it’s likely he’ll eventually get to a rate north of that threshold. Stecher’s never been the best finisher. His HockeyDB page doesn’t count a single double-digit goal among his eight seasons of hockey. All the same, he’d have to be among the league’s poorest scorers for us to expect him to finish the season with a doughnut in the goals column. At some point, Stecher is going to score. The rate he’s launching pucks at the net indicates he might score fairly often, too. And we’ve just touched on Stecher’s even strength prowess. The Canucks are launching unblocked shot attempts on the opposition net at their second-highest rate with Stecher on the ice, opposed to other Canucks blue liners; Stecher is the best if we shrink the sample solely to include goals. Whether Stecher is the Canucks’ best defenceman or not, the fact that it’s a question worth asking is a revelation unto itself. Stecher’s rounded two-way game, ability to hang in there physically with the opposition’s best night in and night out and power play contributions make him a boon on the Canucks blue line. If he isn’t their best piece this season, it’s not farfetched to suggest he’ll get there sooner than later. Good piece, I don’t tend to disagree too much with any of your points but on a decent team, Troy Stecher is not a top pairing defenceman. So long as he continues in that spot we have a problem. This is mostly a well written piece,JD. However,with just a couple more days left in 2016 maybe it’s time to morph into more of a credible ‘Jeff Paterson’ type of journalist instead of the irritating ‘Jason Botchford’ tabloid variety. Remember all that talk last summer about Tyson Barrie? The Canucks don`t need him or want him with Stecher in the lineup. I would have argued that Hutton made Barrie unnecessary. As for the best defenceman, I think Tanev is the best because he can reliably defend with heavy minutes. Stecher is probably the best *healthy* defenceman. The best defenceman is Chris Tanev. Next is probably Alex Edler, Troy Stetcher or the greatly improved, Luca Sbisa. Stetcher has to play more games before I would rank him. At the moment a top 4 guy. Stecher allows the coach to split up his best two D. Of coarse this just gives their defense a better rounded attack. I am very impressed with Stecher but the continual improvement from Sbisa and Tryamkin is what really helps to give hope. You have to think that Lidster is playing a huge role in the overall development of our D core. He is looking like a good hire and is filling in for the loss of Rick Bowness. You’ll note I was talking about even strength production. He’s yet to score a goal in that state.